Chronic kidney disease (CKD) is divided into 5 stages based on the level of kidney function. Tests performed by your doctor determines these stages including a test used to calculate the estimated Glomerular Filtration Rate (eGFR), Which measures how well your kidneys are cleaning your body. Kidney disease is a progressive disease, meaning that kidney function can continue to decline over time, eventually resulting in kidney failure. At the 1st stage there is minimal loss of kidney function; Stage 2, mild to moderate loss of kidney function; Stage 3 moderate to severe loss of kidney function; Stage 4 severe loss of kidney function; Stage 5 kidney failure and need for dialysis or transplant. 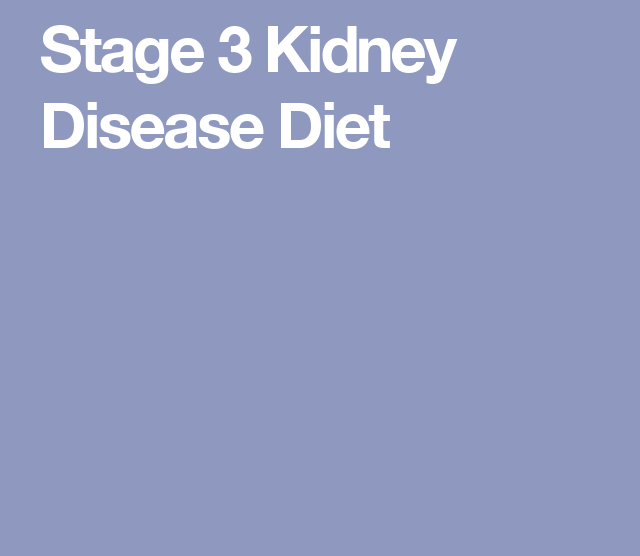 For the purpose of this article, we would take a quick look at Stage 3 and the possible diet to prevent kidney disease from progressing to the next stage. -Serum Creatinine will be higher, indicating less than 30% kidney function. -Change in appetite or eating pattern; you may begin to have a funny taste in food. -Puffiness or swelling: particularly in the hands or feet and ankles, but it will first be seen around the eyes. -Blood pressure increases drastically (Hypertension). -Poor digestion; varying degrees of gastroparesis, meaning that digestion is slowed. -Back pain; chronic kidney disease back pain is usually felt as a dull ache anywhere in the mid-to-lower portion of the back, on one side or the other – this is sometimes referred to as Flank pain or Loin pain. -Urine; Change in color, quantity, and frequency. In fact, the urine may hook exceptionally clear at this point rather than abnormal. Reason being that little is actually filtered into it by your kidneys. Previously High proteinuria and/or hematuria may actually improve. There are majorly three ways to prevent stage 3 CKD, 1. Eat a kidney-friendly healthy diet, 2. Use your prescribed medications and, 3. Exercise (also stop smoking if you are a smoker). But for the aim of this article, we will focus on healthy diet. A healthy diet plan plays an important role in managing kidney shrinkage. It consists of eating the right amount of calories. Some patients may need to reduce their caloric intake, especially if they are overweight. Patients will also need to cut back on foods rich in phosphorus as the kidneys’ ability to process these foods becomes challenging. Some examples are milk, ice cream, nuts, chocolates, cheese, and seeds. The following will give out some general dietary suggestions. Avoid too salty food: When mentioning salt, we can think of sodium. When kidneys are diseased, sodium will increase the burden on kidneys or induce and worsen patients’ complications such as high blood pressure and swelling. Therefore, patients with kidney shrinkage should avoid canned food, processed food, salty condiment, bacon etc. Try not to eat saturated fatty acid: Saturated fatty acid can induce inflammatory reactions, so as to aggravate kidney condition. Animal fat or oil usually contains rich saturated fatty acid, so patients need to stay away from them. Choose high-quality protein as protein source: High – quality protein produce fewer waste products and supplement essential amino acids for the body that can help reduce the burden on kidneys. Be mindful of the source of protein that contains potassium and phosphorus. Remember, It should come from right sources and be consumed in the right proportion. Select correct vegetables and fruits to eat: Since kidney shrinkage is one indicator of end-stage kidney disease, patients may have high potassium or phosphorus level, while many fruits and vegetables are high in these two minerals. Thereby, it is necessary to choose right fruit and vegetables to eat. The list of foods below is deemed “healthy” in kidney disease but also some of the foods are especially beneficial for kidney disease. These foods are marked with an aster-ix. Fruits: Apples, without skin; Apricot; Blueberries*; Grapes, red or green; Peach; Pears, Asian; Pineapple; Plums; Raspberries*; Strawberries; Watermelon. Vegetables: Asparagus*; Cabbage, red; Cauliflower; Celery; Garlic; Lettuce, iceberg; Mushrooms; Onion; Parsley; Radishes; Mung beans sprouted.